I just uploaded a new free tutorial—Creating a Peyote Bezel. For those who have been scared to try this wonderful technique, step by step instructions are now up on my website. The link to a downloadable PDF is located at the bottom of the page. If you’re like me, beaded beads look really intricate and beautiful, but I can never figure out how to make them from just looking at the finished product. 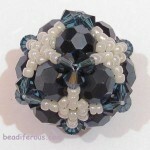 In my internet wanderings, I stumbled upon this website that has some free tutorials for some beautiful beaded beads. My personal favorite is the O Pendant, which I think could make neat earrings as well if you used smaller beads. I like these Seed Bead Weave Earrings. They remind me of Indian jewelry that is popular at Indian Powwow Festivals, and in little stores in the mountains of North Carolina. This tutorial uses bead weaving and stitching to create a beautiful pair of earrings using seed beads. I thought that this free form peyote necklace would be a fun one to introduce during this month when we’re celebrating gemstones and pearls here at Beading Arts. The seed bead work is the perfect frame for your gemstone beads, especially if you mix them up into a sort of “bead soup” like this example. I had a few of these and a few of those, and somehow they all ended up working together well in this piece. I love this one, it’s really adorable. You can also make it in to a potion bottle by putting a bigger bead on top.